Social Gifting - The Next Big Thing | Business Article | MBA Skool-Study.Learn.Share. On a day when the entire world was going gaga over the IPO of Facebook, Facebook was quietly entering into the social gifting arena with its acquisition of Karma, a social gifting startup. Social Gifting, as many believe, is expected to take the world by storm. It is being betted upon as the next big thing in e-commerce. Now let us just take a sneak peek as to what is actually social gifting? Social Gifting is a new trend in e-commerce where we could gift our friends or relatives through Facebook or any other social networking medium. Now what’s so interesting about it? For the end users, it is about convenience and ease of choosing from a wide range of options. Just a smartphone with a social gifting application and our job is over. The giver has the flexibility of choosing gifts from thousands of retailers and also gives receiver the option of customizing his/her own gift. For retail giants like Starbucks and Gap Inc, this is a highly lucrative proposition as it integrates two most effective medium of marketing – smartphones as well as social medium. Another interesting feature in social gifting is the concept of Group Gifting where a group of people come together to present a gift. It may seem as a not so important feature but this feature invariably pulls new customers into the market. It is believed that group purchases result in an incremental 8 new customers per order. The marketing cost involved in social gifting is very less and the customer reach is very high. So, this medium is proving to be quite competitive as retail giants like WalMart, Barnes & Nobel, Starbucks Inc and a whole lot of other retailers are scurrying to make their presence in the online gifting space. This proves to be a blessing to the users as well as they get wider options, good discounts and better quality of service. HOW DO THESE SOCIAL GIFTING APPLICATIONS WORK? These kind of social gifting applications require a Facebook sign-in generally. This enables these applications to pull in the friends of the users and their birthdays. These applications alert the users to gift their friends on their birthdays.Also, reminders can be set by the users to gift their users on special occasions like anniversaries, graduations, baby-showers etc. These apps can also be used for fund raising for various noble causes.With the ever increasing takers for social media and smartphones, a right marketing approach would enable social gifting become the new face of e-commerce. An interesting algorithm these applications have started using is to sense the buying behavior of the consumers through their activities on Facebook. For example: If a person updates his status as, “Gonna chill out at Ladakh!”, the options that these apps would throw out for ‘gifting’ would be travel trip vouchers, winter accessories and so on using the ‘Keywords’ methodology. Since it connects with the sentiments of people, this platform has been called as ‘Friend-To-Friend Marketing’. This type of marketing drives on-line and in-store sales in the market. This also considerably increases the buying experience of the customers by enabling group interactions and peer suggestions. The social gifting is proving out to be major customer acquisition and customer retention platform for the merchants. 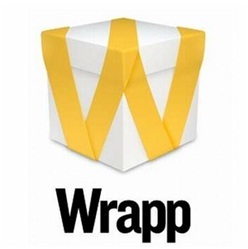 The success ofWrapp, the well-known social gifting application is an excellent example for the success of social gifting.The Sweden based startup has expanded its operations to USA and the millions of dollars in venture capital funding is a testimony to its impressive run. Now, there are over 2,00,000 active Wrapp users with more than 1.6 million gift cards redeemed in stores operated by more than 70 U.S and European retail giants. 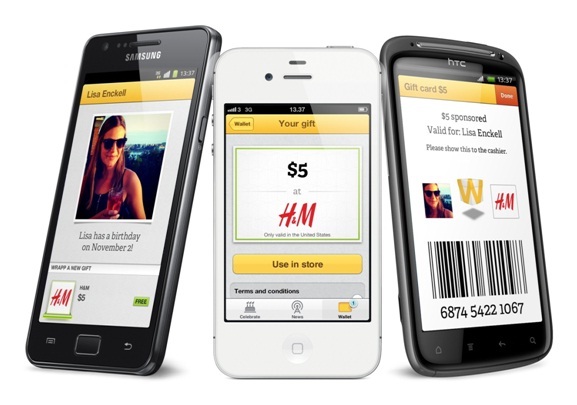 HOW BIG CAN SOCIAL GIFTING GET? The gift card industry alone is a $100 billion dollar industry E-Gifting, still in the infant stages, has a share of $ 1 billion. In this, 50% of the revenues come from social gifting. With the technology developments, this industry is expected to dominate the entire gift card industry. Starbucks predict 20% of its revenue through social gifting in the near future.This shows the reach and impact off social gifting in the future. 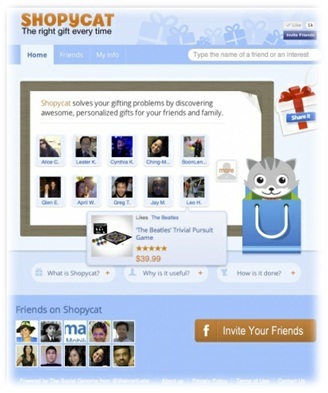 The importance retail giants are giving to social gifting can be further explained by the fact that WalMart has launched the first ever social gifting platform ‘Shopycat’ which has an interesting feature of suggesting gifts based on their Facebook profile. Social Gifting has been quite prevalent in the European and American markets. It is yet to find its foot in the Indian markets. But the scope and scale that will be offered in the Indian markets look mind boggling. A nation of around 1.2 billion with the number of tech-savvy people continuously on an increase, organizations would love to make use of this social gifting platform to attract new customers. Further, India is a ‘Country of Celebrations’. The large numbers of festivals like Diwali, Sankranti, DurgaPooja, Holi, Dussehra among others provide a massive opportunity for social gifting in our nation. The retail giants and other merchants would definitely love to capitalize on such a market. This makes India an attractive destination. With major social gifting players having not set their foot in India, it also gives an ideal opportunity for Indian e-commerce players to make a mark. An intelligent marketing campaign would make social gifting go viral in India. It would also receive patronage from players like flipkart, e-Bay, Amazon and others.Hence, the untapped potential of Indian markets should be recognized at the earliest and the retail giants must make a quick move to enjoy the first-mover advantage. Social gifting, which is still in its nascent stage, is likely to be the next big thing in e-commerce. With increasing number of ‘techies’, social gifting will be embraced by people all over the world. So, it is very critical for the retail giants and the gifting industry to keep in pace with the latest developments and enter into this domain. It not only reduces costs and increases the customers but also delivers that highly required ‘value to the customers’.Further, social gifting, is not going to become a choice – rather, it is likelyto become a way of life!! This article has been authored by Vignesh C from NMIMS and Divya B from IFMR.